Tasty Tuesdays! The Linden Life: Tasty Tuesdays! Every Tuesday I will attempt to make something new, and I'll share the pictures, recipes, and our reviews. Since the Littlest Linden still doesn't eat much, for the most part Tyler and I will be the only tasters. 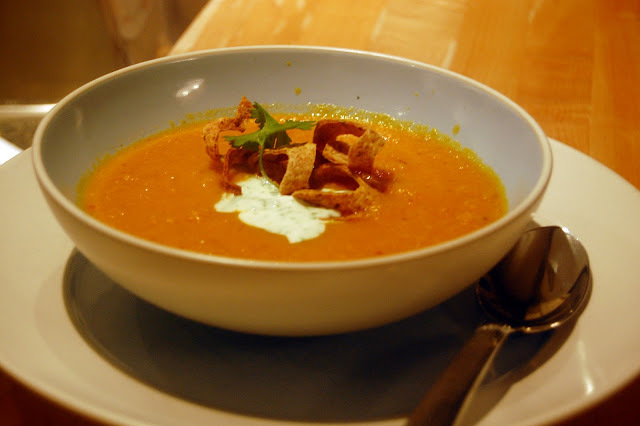 Tonight I made SouthWestern Sweet Potato Soup from Chef Michael Smith's 'The Best of Chef at Home'. It was really easy to make, and we both agreed that it was delicious. The recipe can be found here. My favourite part are the little tortilla croutons. They are simple to make, and the soup looks so much more appetizing! I would definitely add these little croutons to other soups. I took a flax seed whole wheat tortilla (any would work for this), rolled it really tightly, sliced it thinly on a diagonal, placed the roll ups on a baking sheet, drizzled with a tiny bit of olive oil, and popped them in the oven for about 12 minutes at 350ºF. Yum. A hearty soup for a cold winters night!